We got an early start today — we had to. This morning 15 cars in our category had passed tech inspection, but only four had gotten runs in. That meant that the starting queue would be a long line and might limit us to only one run. Ergo: an early start. Brandon getting strapped in at the starting queue Sunday morning. We got down to the car and double checked all connections and systems. Everything seemed in order so we pushed the car out to the starting queue. Even then there were already a number of teams ahead of us. Fortunately, the line progressed quickly and we were soon on the starting line with race officials performing their final checks in order to calculate our mileage. We got the green flag and the car was off with Brandon Riches driving. We counted down 10 laps of the course, taking about 21 minutes over 6 miles. 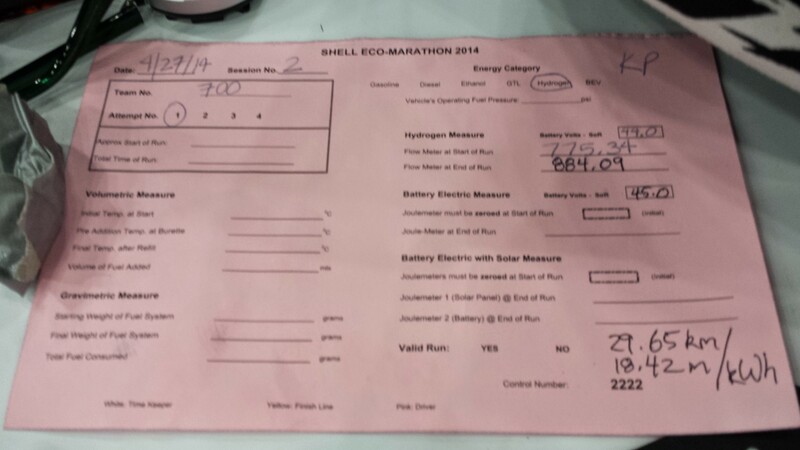 The judges took our readings and handed us a number: 28.74 km/kWh. This equates to a fuel economy of about 528 mpg (miles per gallon) of gasoline. 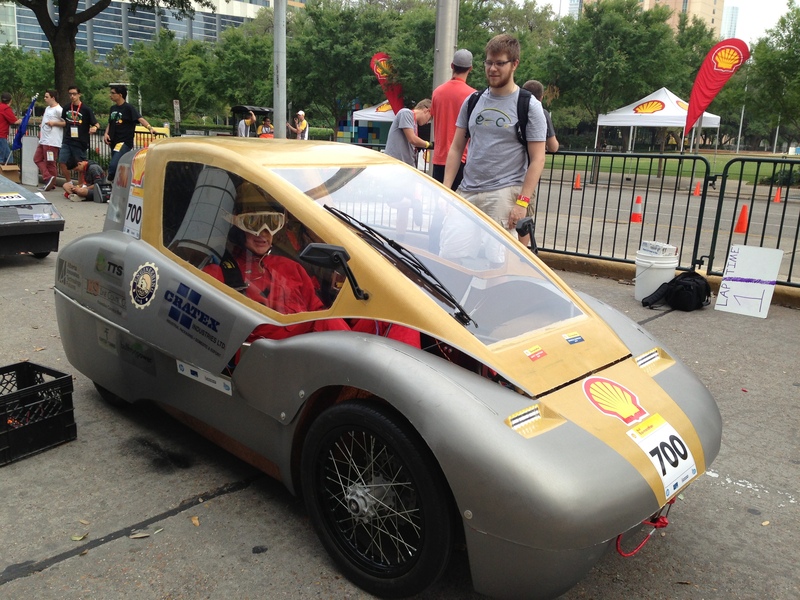 We pushed the car directly from the finish line to the starting line and got suited up again. We had just enough time to get one more run in before they closed the track. The previous time our focus was to get an initial run in so that we would be on the score board. This time the goal was to keep time as tight as possible and milk as much efficiency out of the car as possible. That is one good looking Eco-Car. We queued up and ran again, this time more comfortable with our car/driver communication. Every lap was tightly timed to keep only a 20 second difference between the maximum time and our time. 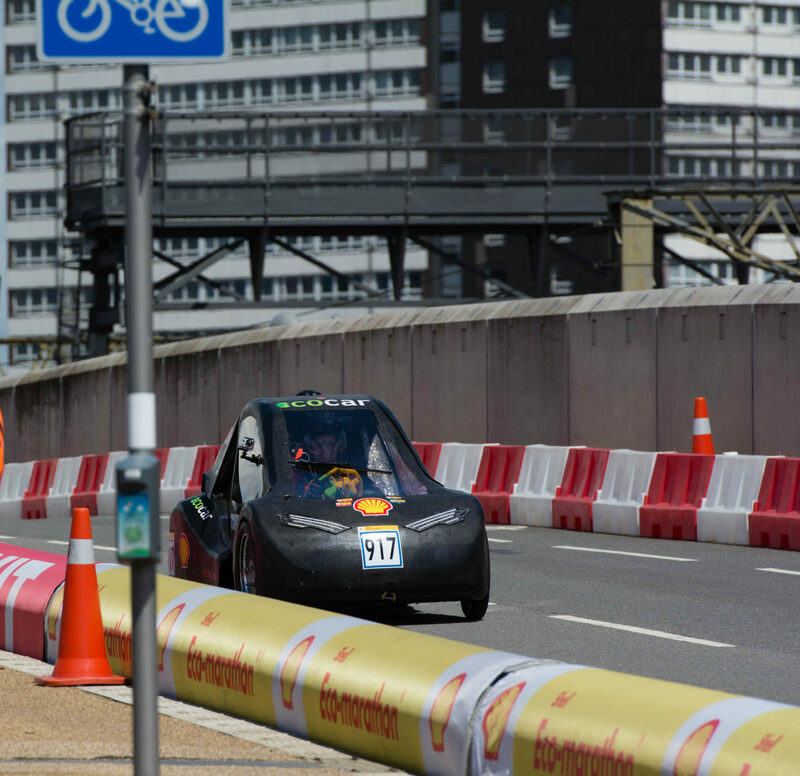 After lap 10 we pulled in and got the reading: 25.39 km/kWh or 598.7 mpg equivalent of gasoline! 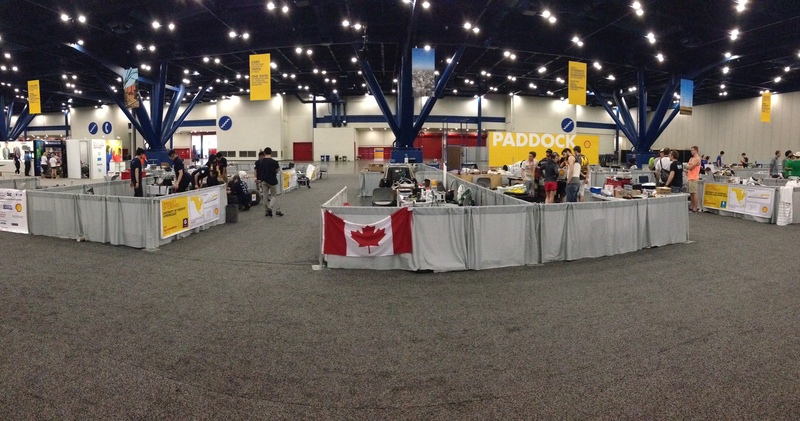 Our paddock, with a few customizations to make it more home-y. It felt like half the day had passed, but in reality it was only 9:30 am. We went back to the paddock in a celebratory mood. The car had performed perfectly and we were in the lead. We went for lunch, talking and joking around, but it quickly turned into shop talk: How could we squeeze out just a bit more fuel efficiency from the car? After a lengthy discussion that took us back to the paddock we decided on two improvements: tune the timing on the purge valve of the fuel cell, and remove the boost converter. A 10,000 foot view of a fuel cell leaves a pretty simple picture: hydrogen and oxygen come in, and water and energy comes out. The purge valve is located after the fuel cell and – as its name implies – it is responsible for letting out the produced water from the fuel cell. When the fuel cell is running, we open the valve every so often, for a specific period of time, to exhaust the water. If we release the exhaust too often we get un-reacted hydrogen in the exhaust — which decreases our fuel efficiency. If we don’t exhaust often enough we risk decreasing our efficiency and potentially damaging the cells. Our fuel cell is damaged. It is supposed to output a full 48 volts, but a few cells died within it (it has 48 cells) and so it only outputs ~45 volts. This is a problem because the amount of torque we get from the motor – and thus our max speed/acceleration — is decreased. The boost converters job is to ensure that the motors always see 48 volts. This is necessary in regular operation when you step on the gas, as this will pull more power from the fuel cell and decrease its output voltage as it works to supply the needed power. In our case, it also helps with the damaged fuel cell. 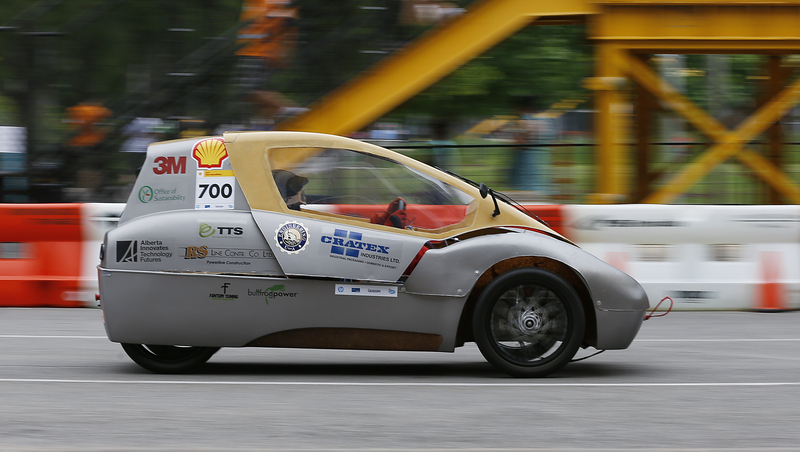 During our two runs we found that we weren’t having to push the car very hard to maintain the optimal cruising speed. This lead us to believe that we might not need the boost converter, and could just run directly off the fuel cell (and super capacitors). Lining up for the afternoon race. We made our adjustments and got in line for the track 30 minutes early. There was already a decent line up. We waited and eventually got through the measuring tent and onto the starting line. Super capacitor voltages were measured, our hydrogen flow meter checked, and the fuel cell started. We got the green flag and — nothing. We ran through our checklist. Fuel cell: check. Sensors power: check. Motor power: check. Capacitors connected: check. Brandon and I crowded around the back of the car (only two team members + driver are allowed at the starting line). We saw a loose connection, fixed it, and ran through the checklist. No go. We kept looking, but to no avail – everything seemed in order. We reluctantly backed off of the finish line and returned to the queuing lanes. The back shell came off, followed by the luggage rack, and the team gathered around. It was amazing really, I’ve never seen so many people work together that well. We put the car up on a block and started rapid-fire debugging. We found the problem. Two connectors had been knocked loose – one on the auxiliaries power, and one going into the motors. We made several attempts at fixing the connection until we finally got it. And just in time — we rolled up less than 5 minutes before the track entrance closed. The technicians and race officials excitedly pushed us through. We were the last car through. We lined up at the starting line and got a green flag. I felt everyone hold their breaths. And — the car picked up speed and pulled out onto the track! The official pink slip recording our mileage on the winning run. We made it through the full ten laps — dreadfully expecting the car to join the hordes of other cars lining the edge of the track with technical problems. As the car pulled up we excitedly measured and got our results — 29.65 km/kWh or about 618 mpg or 0.1 L/100 km equivalent of gasoline! This score kept us in first place, with a healthy lead on the competition. We won. 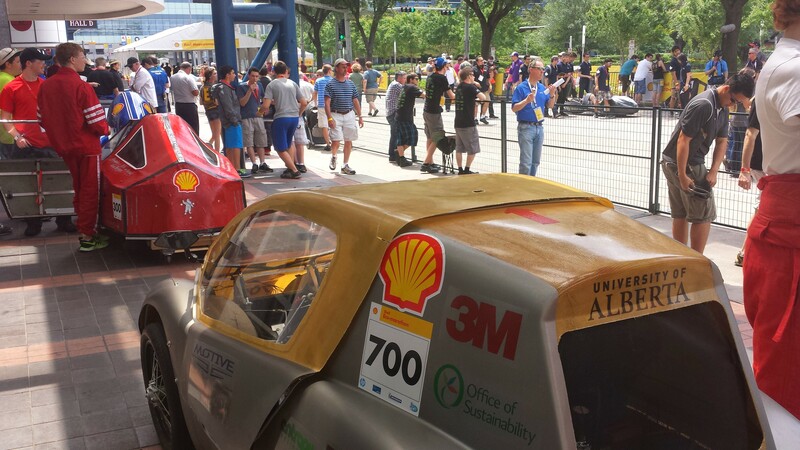 Michael is the Electrical Team Lead on the University of Alberta Eco-Car team. 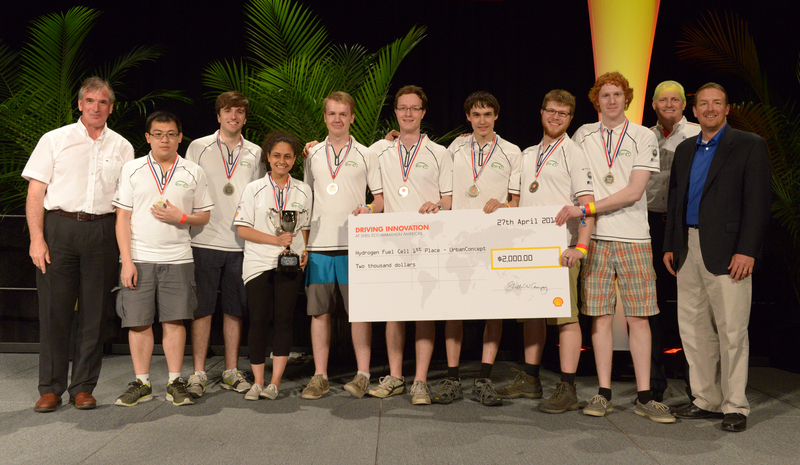 This is his second year on the team, after taking the position of Sensors Team Lead in summer 2013. He is in his fourth year of Computer Engineering.